Years ago, 2011 I think, I was with another agency working with a large client. We were running an engagement campaign on Twitter. When the campaign came to an end, I was asked to prepare a final report for the client. I was asked to include some of the basic metrics like Mentions, Retweets, New Follows, Replies, and Reach. This was all fine and dandy until I got to Reach. How could I calculate Reach? The nature of Twitter makes Reach seem like an obvious choice for a metric. Tweets are all public (unless of course you’re set to private) so there’s major potential for buttloads of people to see what our client was tweeting! But if you think about how you interact with your feed, what could qualify as someone’s tweet reaching you? And how does that differ from an impression? Let’s back up and define “reach” so we can figure out our calculation. I went to my director and informed her that I didn’t think calculating Reach was possible because it’s impossible to know if people actually saw a tweet just because it showed up on their timelines. People scroll quickly and overlook tweets all the time. And this doesn’t even include people who aren’t logged in at the time of the tweet! Our potential reach is 2,510,000. Great, so our campaign only took 10 tweets and we reached two and a half million people. Not bad! I returned to my desk after her failed negotiation with me. Someone else did ‘my work’ and the report went out to the client. I regret to tell you that this is extremely common in the agency world. In case it wasn’t clear, Reach and Potential Reach on Twitter are garbage metrics — they’re fiction. This is the phenomenon of teaching to the test. Tests are supposed to measure understanding of some material but the way it’s presented is sometimes only to the benefit of the teacher or school district to maintain ratings and/or funding. In other words, chasing clicks, impressions, or any other metric will lead you down the wrong path. Your basic marketing goal is to find and connect with the audience who would most benefit from your product or service and to do this in the most helpful way possible. The most basic metrics like clicks and impressions ONLY make sense in context, EVEN if they seem easy to understand. But more on that later. When you’re not part of the process, it can be challenging to stay engaged. And if you’re receiving reports, you’re probably not part of the process. What is present can be misleading or outright horseshit (as we saw with Twitter Reach numbers). This is probably more rare, but it happens. 1) Awareness Goals: Are you happy with the additional site traffic you’re getting? 2) Conversion Goals: Is more money coming in than going out for ad spend and management fees? If you’re not seeing results in a couple months, it’s time to ask your PPC managers what’s going on. Weekly reports should be designed so you have some sense of control even after handing over the reigns or passing the baton or whatever cliché you enjoy most that means giving control to someone else. If you’re still with me, which honestly I’d be impressed if you are — then we ought to get to what matters most on our reports: the metrics! This will not be an exhaustive list of metrics, but the important part is that it’s a list. A conversion is some action taken by a person that you define. Before you begin, make sure you understand what your customers want and expect and build the campaign around that. If that wasn’t clear, you are not supposed to start with what you want. If it’s a Search Network-based PPC campaign, your conversion might be a form submission from your website or a sale. THIS SHOULD BE INCLUDED in your reports. Practically speaking, a conversion is typically a proxy for some arbitrary value; it’s a stand-in for something of real value. A reservation form submission is a conversion. The dinner receipt is the real value. A signup form submission is a conversion. A later purchase is the real value. Ticket sales can also be conversions. In some cases you can add in the actual transaction value for these conversions — This depends on ticketing vendors and your PPC manager. Campaigns that track sales provide the best case scenario for campaign managers too. Our objective as managers is to find combinations of campaign components (landing page + ads + targeting) that most reliably contribute to whatever the goal is for the specific campaign. So the more feedback about sales, the better we know how to tweak the campaign to get more sales. The cost per conversion metric concrete-ifies conversions. Where conversions are a proxy, cost per conversion provides some sense of value to conversions. Cost per conversion is: Cost divided by number of conversions. Let’s say you’re advertising private event space rentals. You have a daily budget of $25, or $175/week. If the campaign uses the entire budget, you’ve spent $175 in one week. Here’s how much conversions cost on that budget, assuming the budget is exhausted by week’s end. If a single event (one conversion) brings in $200, you have $25 for your return on ad spend. Get your net return by factoring in campaign management and/or staff costs. Sticking with the $200 per event, two conversions would yield a return of ($200 * 2) – $175 = $225. With just one additional conversion, you’ve made $200 more on the same budget. 20 total conversions ($4,000) – total monthly spend ($700) = $3,300. Subtracting out advertising management fees (for example, our fee is $750 per month), you’re left with: $3,300 – $750 = $2,550. Not bad. And that’s just the cash value! If your customers enjoy their experience with you, there’s of course great potential for referrals. Indeed there is great variation in the number of conversions over time and actual receipts will vary too. But the point is that if you understand your cost per conversion, you can easily justify your ad spend. And even moreso if you have receipts to correspond with the ad spend. It takes a click to create a conversion, but it only takes one. Sit with that one for a second. We all want clicks. And the more, the better, right? I want to take a minute to clarify the first point. Obvious fact of the day: Not everyone who clicks on an ad will make a purchase. But we also don’t want it to take 1,000 clicks to get one conversion. The natural next question is how many clicks DO we want? My non-answer is: As many as it takes to maintain a positive return on your spend [if you’re running a search campaign]. If you’re seeking awareness, get all the clicks you can until your money runs out. The ideal situation is a balance of clicks, impressions, and conversions. So we want to look at the average clickthrough rate (impressions / clicks) along with conversions. If these kinds of numbers go on for weeks, I look at this and see that something is wrong. Sure 6.25% clickthrough rate is great, but with no conversions, those clicks are meaningless. We’re reaching the right people because we’re seeing conversions but the clickthrough rate is indicating something different now: We have some good targeting and room to narrow the targeting too. We’re reaching the right people but also a lot of irrelevant people. 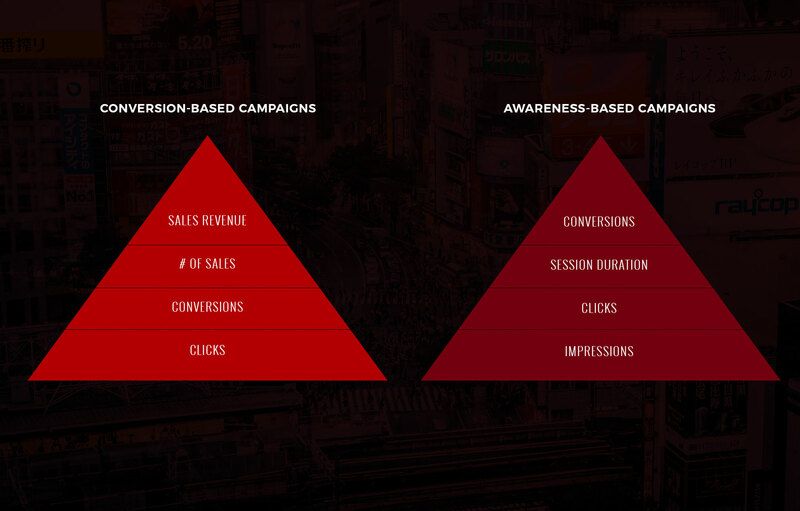 Average clickthrough rates vary across industries and campaign configurations. The first couple months of an ad campaign are so critical to pay attention to for this reason — campaigns need to establish some kind of baseline ratio of clicks to impressions. In time you’ll get to know your range for clickthrough rate for your budget. There are some important nuances you should be aware of and it requires knowing the right questions to ask. Are there keywords that get a lot of impressions and few clicks? Are there keywords that get a lot of clicks and no conversions? Sometimes you’ll find these keywords used to be great and they’re just not performing any more. Take note of these though—they’re probably worth experimenting with again later on. Congratulations, you’ve now passed digital advertising university. I’m kidding of course, we barely scratched the surface. But you should feel a little better about the reports you may or may not be getting. Ask questions. Ask as many questions as it takes until you understand what’s going on with your campaigns.